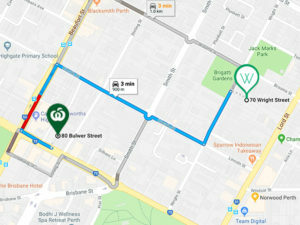 Woolworths Plans to Open up near Wright St! 🎉GOOD NEWS for Wright St: Woolworths plans to open up in Highgate!! The company have recently purchased a property in 80 Bulwer Street, Highgate which is only a 3 minute drive or 9 minute walk away from Wright St! A Woolworths spokesperson confirmed that the company have recently acquired the property at 80 Bulwer Street, Highgate as they believe there is an under supply of supermarkets in Highgate and the surrounding areas. Website by Milk Web Design.